The Int. OCEAN FILM TOUR Volume 6 takes you out to the sea. Look forward to the latest and greatest marine adventures and water sports films on the big screen - with lots of action on and under water, exciting stories about the sea and salt in the air! 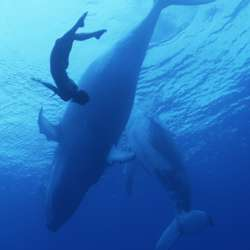 The International OCEAN FILM TOUR is more than just a film programme. It doesn’t just want to show the beauty of the sea on the big screen; it also want to help preserve it. The screening starts at 16:00. We will meet 30 minutes before to secure good seats. The complete program has a total length of about Protected content , plus a break of about 30 minutes. With a supporting programme such as moderation and competition, an event lasts a total of approx. 2. Protected content . We can go for a drink or dinner afterwards, if we like.